All of us hope that we will never have to use it, but knowing the new guidelines for CPR can save someone's life. Watch this video to get tips on the procedure and to see it demonstrated. The early bird registration for the 2010 NARHA National Conference and Annual Meeting, presented by Purina, has closed, but that doesn't mean you can't still register! From October 1-18, members will be able to register for $600 and non-members for $660. After October 18, you will only be able to register at the door. Onsite registration will then be $675. Workshops and sessions are filling up fast. Register now so you can get in on the sessions you most want to hear. Remember: This year, you will need to show your name badge to get into sessions and to get on the bus for the horse expo. You will also need meal tickets for every meal. These will be in your registration packet when you register at the hotel. This policy will ensure that everyone who registered gets the full benefit of the conference. So please don't forget them! Susan Rugari, an assistant professor at Texas Christian University's Harris College of Nursing & Health Science, presents "The Process of EFP and EAP: An Ethnographic Pilot Study." By describing and recording patterns, processes, behaviors and interactions among the therapist, horse, horse professional and client team during EFP/EAP sessions, this workshop looks at how to research the intervention's perceived emotional, communicative and relational benefits. Elizabeth Adams, the program director at Pegasus Therapeutic Riding, Inc., a NARHA Premier Center in Brewster, NY, will give practical knowledge and tools to participants on "Starting an Interactive Valuting Program." 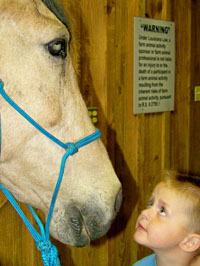 Topics include how to select participants, select and train horses, and promote the idea to staff, board members and parents. Come join us in November! For all the scheduled sessions, see the online registration book. With all of the flooding and fires going on around the country right now, we wanted to remind you that NARHA has a disaster relief fund to assist NARHA centers with an immediate need in funding expenses not normally covered by operating insurance after natural or man-made catastrophic disasters. This includes disasters such as hurricanes, earthquakes, tornados, floods, fires and drought. Find the Disaster Relief Fund guidelines and application here. The American Horse Council reported that President Obama signed the Small Business Jobs and Credit Act of 2010 into law recently. The bill is intended to help small businesses and to create new jobs. The bill continues the bigger write-off for horses and other property purchased and placed in service by a horse business that was originally included in earlier stimulus bills. Read the full press release here to find out if you qualify for any of the incentives.